A battered-looking copper ring holds an old key and a worn, Art Nouveau style, imitation amber pendant. The ring is handmade from copper, and has been artificially aged or 'antiqued'. I hammered the ring (using an old panelbeating block that belonged to my grandfather) to give it texture, and rubbed it slightly with super fine steel wool to give it some highlights. It is unsealed, so it will continue to change its look over time, with wear and age. 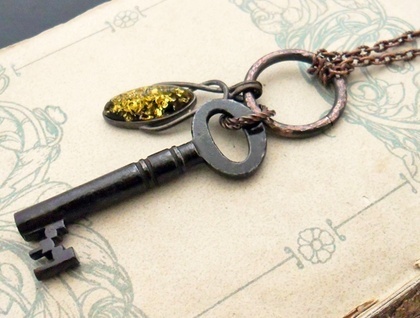 The key is old, possibly vintage (30 years old or older), of unknown provenance. Age has turned it a deep, slightly rusty dark brown. I have sealed it with clear varnish to preserve its aged look and to prevent any rust or tarnish from rubbing off or spreading to your other jewellery. The pendant appears to be copper based, and seems have been plated with silver, which has mostly worn off now. I'm not sure what the imitation amber is made from. 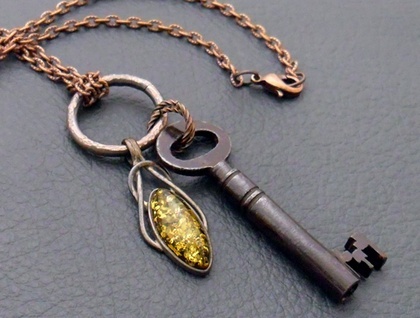 It has a greenish-yellow hue, so is not designed to resemble the golden-orange amber but the rarer green amber. The key is suspended from the large ring by means of two interlocking, antiqued-copper coloured, twisted rings. 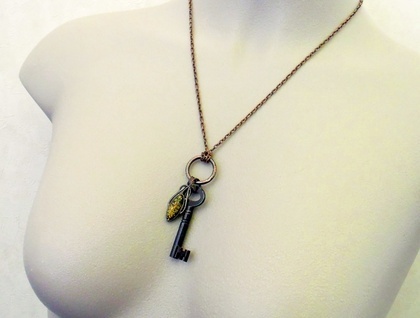 The chain is iron based, with an antiqued-copper coloured finish, and has textured oval links. 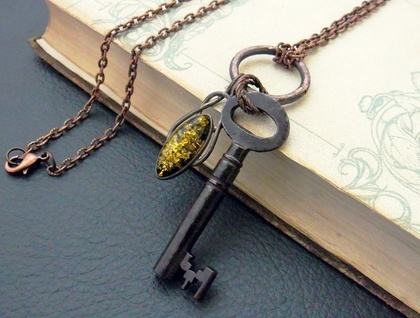 The necklace fastens with an antiqued, copper plated, lobster-claw clasp. 'Inbar' is a Hebrew name that means 'amber'. This necklace is a unique, one-off Silverlight Jewellery design, never to be repeated. The chain measures 54.9cm, including the lobster-claw clasp. The old key measures 50mm from top to bottom, and 18mm across the bow. The faux amber pendant measures 34mm from top to bottom. To clean this necklace, wipe it gently with a damp cloth.